Guèye (2000) writes that 85% of rural households in sub-Saharan Africa keep chickens or other types of poultry. This is a huge proportion of these populations, but what is the value of smallholder chicken production, socially and economically? Photo from Flickr by USAID. Low-input farming: Chicken offer genetic resources potential in sub-Saharan Africa, and could allow the transitioning of smallholders from a low-input, low output system, to alternative systems with still relatively low-inputs but significantly higher outputs. Income generation: If a farmer transitions from indigenous scavenging to brooded, low-input birds, that farmer has the potential to increase his/her net value of chicken production to more than USD 850 per year by purchasing and managing 50 dual-purpose birds under low-input, without significant risk exposure (Bill & Melinda Gates Foundation). Past efforts to abruptly transition a large number of poor smallholder farmers to the intensive system have resulted in high risks to the farmers, low realized production, and productivity, and often high losses, which has historically served as a barrier for entry for most of them. Risk reduction: The technological breakthrough in tropical poultry breeding in India and certain African countries and access to animal health products, such as the thermostable Newcastle Disease vaccines from GALVmed, significantly changes the productivity and mortality risk to smallholder chicken farmers. 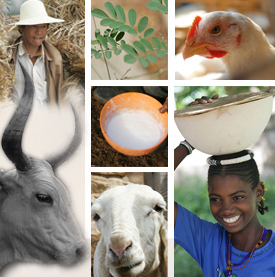 Increased protein production: Protein is generally in short supply in the developing world and can significantly increase nutrition. The African Chicken Genetic Gains (ACGG) program is partnering with the Agriculture to Nutrition (ATONU) initiative to improve chicken’s contribution to nutrition in Africa. Way out of poverty: A recent analysis conducted by the Bill & Melinda Gates Foundation based on actual market data from East Africa shows that the potential income from raising low-input but high-producing chickens under low-input conditions offers a sure way out of poverty for many poor farmers. Directly benefiting women: Chicken productivity improvement initiatives directly benefit women who comprise the largest proportion of smallholder chicken farmers in the developing world. Easily sold on the (growing) market. Chicken are easily sold in markets due to a number of factors, including their low economic value compared to e.g. beef and the lack of religious taboos around chicken and their products. Demand and the price of chicken and chicken products is growing in Africa and the Middle East which offers market opportunities for smallholders to increase the outputs of their chicken production systems. Social aspect: Chickens add value to social structures in Africa. They play an important part in many festivals, both religious and non-religious. For example, it is customary for Ethiopian Orthodox Christians to break their fast with a chicken-based dish called doro wat, literally translated as chicken stew. Tadelle, D. 1996. Studies on village poultry production systems in the Central Highlands of Ethiopia. MSc Thesis, Swedish University of Agricultural Sciences, Uppsala, Sweden. Guèye, E.F. 2000. The role of family poultry in poverty alleviation, food security and the promotion of gender equality in rural Africa. Outlook on Agriculture, 29(2):129–136 (available at http://www.ingentaconnect.com/content/ip/ooa/2000/00000029/00000002/art00007). Tags: ACGG, Africa, gender, smallholders, women. Bookmark the permalink. We are poultry equipment factory. How many chicken layers you will raise? What is the size of your chicken house? We can make the quotation according to the chicken numbers and chicken house size.